LAST GAME 12/22/13: Titans 20 at Jaguars 16. Tennessee WR Nate Washington catches 6 passes for 117 yards, including 30-yard TD. Titans RB Shonn Green records 91 rushing yards & TD. LAST GAME AT SITE 11/10/13: Jaguars 29, Titans 27. Jacksonville RBs Maurice Jones-Drew & Jordan Todman each score rushing TDs. Jaguars CB Will Blackmon returns fumble 21 yards for TD. BROADCAST CBS (12:00 PM CT): Andrew Catalon, Steve Tasker, Steve Beuerlein (Field reporter). SIRIUS: 91 (Jax. ), 137 (Ten.). XM: 231 (Ten.). JAGUARS: In only career road start (vs. SD in Week 4), rookie QB BLAKE BORTLES (No. 3 overall) completed 29 of 37 passes (78.4 pct.) for 254 yards with 1 TD for 81.6 rating. Has 68 rush yards on 11 att. (6.2 avg. )…In only meeting (10/7/12 with Min. ), RB TOBY GERHART rushed for 41 yards on 6 att. (6.8 avg. )…Jags are only NFL team this season with 2 rookies with 200+ receiving yards each (WRs ALLEN HURNS & ALLEN ROBINSON). Robinson led team in catches (5) & rec. yards (51) vs. Pit. Aims for 5th in row with 4+ catches. Hurns has 3 TD catches, tied for most among NFL rookies. WR CECIL SHORTS III has TD catch in 3 of past 4…Defense has 16 sacks, 3rd most in NFL…LB PAUL POSLUSZNY leads AFC with 53 tackles, including team-high 12 tackles & sack last week. DT ABRY JONES had career-high 2 sacks & FF vs. Pit. Had 1st career half sack in last meeting. DE ANDRE BRANCH has 2 sacks in past 3 on road. In past 11 on road, DE CHRIS CLEMONS has 7.5 sacks & 3 FF…TITANS: QB JAKE LOCKER had rush TD & pass TD last week. QB CHARLIE WHITEHURST set career-highs in pass yards (194), TDs (2) & rating (123.9) vs. Cle…RB SHONN GREENE has rush TD in 3 of past 4 games vs. Jax. Has 3,908 career rush yards & needs 92 to reach 4,000 career…Last week, WR KENDALL WRIGHT had 6 catches for 47 yards & 2 TDs & added 43 rush yards on 2 att. (21.5 avg.). Has 3+ catches in 19 of past 20 overall. WR NATE WASHINGTON had 4 catches for 57 yards last week. 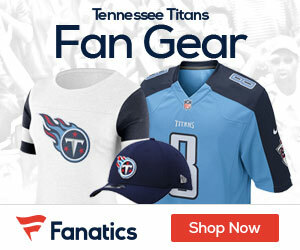 Since joining Titans in 2009, leads team in rec. (277), rec. yards (4,081) & TD catches (26). TE DELANIE WALKER leads AFC TEs in catches (26) & rec. yards (364)…S MICHAEL GRIFFIN leads team with 37 tackles. LB KAMERION WIMBLEY has 4 sacks in past 5 vs. Jax. LB DERRICK MORGAN has 4 sacks in past 3 vs. Jax. S GEORGE WILSON had INT in last meeting. Since 2007, S BERNARD POLLARD is 1 of 4 NFL players with 12+ INTs (12) & 10+ sacks (10.5).